The Colorado Rockies defeated the Los Angeles Dodgers Saturday night, 4-2 behind a strong start from starting pitcher Kyle Freeland. The win moved Colorado to 78-63 and extended their National League West lead to 1.5 games ahead of the Dodgers. Both starting pitchers were sharp out of the gate as there with little-to-no traffic on the base paths early. The Rockies finally broke through against Dodgers starting pitcher Walker Buehler in the bottom of the third inning when veteran catcher Chris Iannetta blasted a solo home run to right field to put the Rockies on top 1-0. The home run was the 10th of the season for Iannetta, which also happened to be a historic hit. Iannetta became the first catcher in Rockies history to have four seasons with 10 or more home runs. With a lead, Freeland mowed down the Dodgers in the fourth inning. The Rockies proceeded to add an insurance run in the bottom of the fourth inning. David Dahl ripped a one-out double to right field, then scored to push Colorado’s lead to 2-0 on an Ian Desmond RBI-single to right field, beating the shift. Los Angeles brought the game back to within one run in the fifth inning when Chris Taylor hit a 1-2 slider into the bleachers in center field off Freeland. The Rockies however quickly countered in the bottom of the fifth inning, which started with a double by Iannetta. One batter later, Charlie Blackmon watched the first two pitches for passed balls — a fastball and slider — before smacking a 2-0 slider over the right field fence for a two-run home run. The home run was the 24th of the season for Blackmon and put the Rockies ahead 4-1. 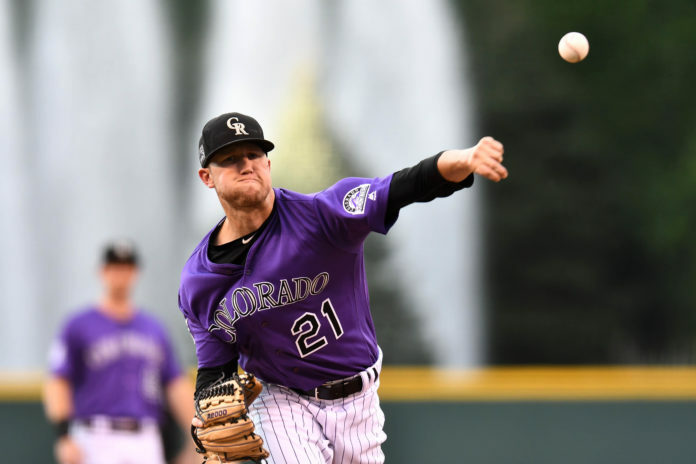 Freeland proceeded to shut the Dodgers down in the sixth inning to preserve Colorado’s lead, handing the ball over to the bullpen with a cushion. Freeland was firing on all cylinders throughout his start and finished with a line of six innings pitched, allowing one run on four hits while striking out eight batters. Freeland’s ERA this season at Coors Field now sits at 2.21. 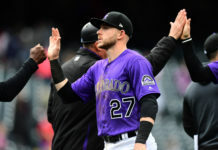 Scott Oberg and Adam Ottavino each worked clean seventh and eighth innings which handed the ball over to Rockies’ closer Wade Davis for the ninth inning with a three-run lead. Davis surrendered a run in the ninth inning but buckled down to capture the victory and solidify his 39th save of the season. The Rockies and Dodgers will finish their series Sunday afternoon at Coors Field with first pitch set for 1:10 MST.